The name is strictly linked to the town location, an ancient castle (Castello) situated by the Reno bank (argine). Castello d'Argile was born and has always lived in symbiosis with the River Reno, so much so that the embankments, or more precisely the "argille" (clay) which makes its terrain so rich, are even part of its name. In the central square, there is the Church of San Pietro of Argile, containing fragments of a precious, rare fresco attributed to Simone dei Crocifissi. The building, which houses the City Theatre, was built in 1907 as a "Casa del Popolo" and inaugurated once more on the 25th April 2004. Passing, perhaps by bicycle, between the cultivated fields of the surrounding plains, it is impossible not to notice the majestic, and in a certain sense surprising, Church of Santa Maria of Venazzano. Not far away in Ronchi, the Torre Marsigli is a beautiful example of tower-dovecote, probably originally defensive. 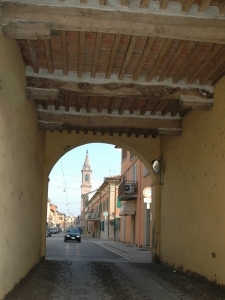 Still in Ronchi, there is the Osteria della Stella, a resting place for travellers and pilgrims since the 17th century.